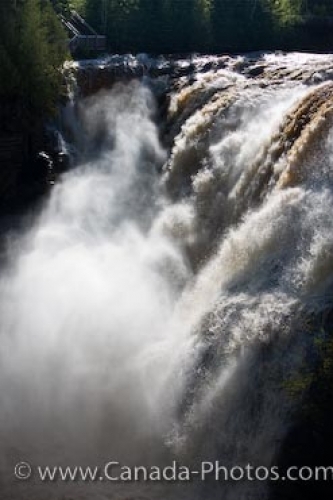 From the rocky ledge of the Kaministiquia River, the Kakabeka Falls cascade into a watery mist below. Heavily cascading into the Kaministiquia River, the Kakabeka Falls flow into a heavy mist below in Kakabeka Falls Provincial Park. The foamy waters are the result of a spring flood. The amazing falls are a beautiful watery foamy blur. The heavy falls cascade over the ledge of the river. Kakabeka Falls (aka Niagara of the North) along the Kaministiquia River during a spring flood, Kakabeka Falls Provincial Park near Thunder Bay, Ontario, Canada.